Lyric video for “Zombie Blood Curse” is online now! 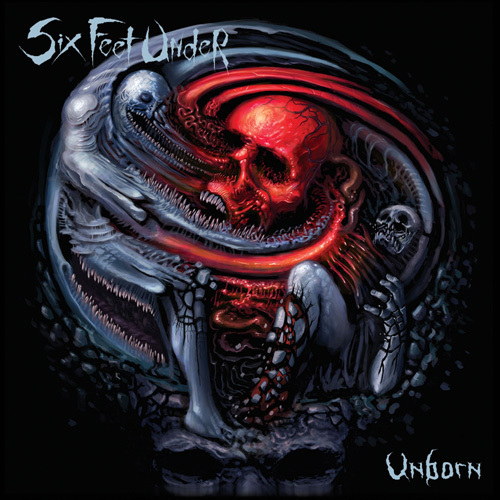 Death metal behemoths SIX FEET UNDER are back, and with the seething Unborn, the tenth full-length of their imposing career, they are out for blood. Led by the inimitable Chris Barnes, owner of one of the most powerful and instantly recognizable voices in the genre, the band are returning with an overhauled line up that sees them reinvigorated and churning out some of the most visceral music they have ever put their name to. Undead proved to be one of SIX FEET UNDER’s most critically acclaimed albums to date, and with a revamped and tour-hardened lineup rounded out by: guitarist Ola Englund, drummer Kevin Talley, bassist Jeff Hughell, and long-time guitarist Steve Swanson, Unborn promises to elevate the band to even loftier heights. The lyric video for Zombie Blood Curse, the first track to be loosed from Unborn, is streaming now at metalblade.com/sixfeetunder. While there, fans can also pre-order their copies.